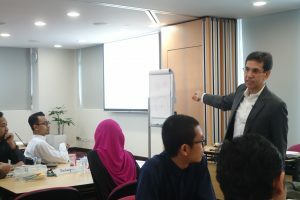 The conventional approach of focusing on study tracks and specialisation in Islamic studies (takhassus) offered by overseas universities does equip students with the broader knowledge and skillset to engage the complex and multi-faceted issues facing contemporary and pluralistic societies. Furthermore, programmes or courses offered by these universities are not regularly reviewed to meet the demands of religious life and challenges that confront Muslim communities and society at large. Understandably, these programmes and the educational experience offered by the universities reflect the social milieu and geopolitical realities of the region where the universities are located, and therefore it is imperative for students to understand the importance of context and to apply knowledge learnt from text to a defined and specific context. 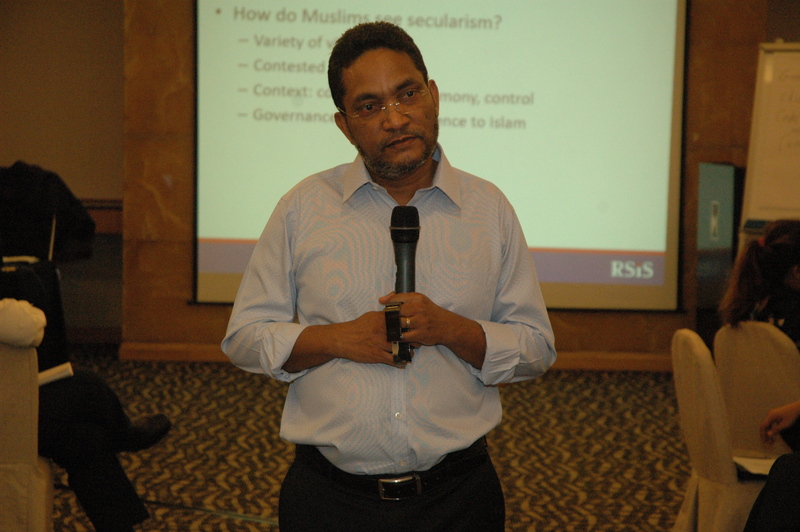 Dr Albakri identified and elaborated four issues that will be discussed during the course, namely: Islam in the Modern Nation State; Contestation on Religious Authorities; Religion as Living Reality; and Diversity. These issues represent the evolving context in Singapore which must be taken into cognizance when religious text and tradition are deliberated with a view to provide guidance and solutions for the community. The fixation with defining Sharia as Islamic law can hamper society’s progress when Sharia in Islam is in fact a guide for Muslims to move forward towards achieving their goals. Unlike Sharia, debates on fiqh (jurisprudence) are about specific rulings derived from primary Islamic texts. These debates rarely mentioned the maqasid (higher objectives) behind the rulings yet the application of a ruling would be imperfect if it did not meet, or contradicted, the maqasid. The responsibility of future religious leaders and teachers is to provide solutions to new and contemporary issues. This is done by building their expertise on the methodologies to engage with the primary sources in Islam and then applying them to new everyday realities. Linguistic and contextual limitations such as history and traditions are pervasive when interpreting texts. Thus, by and large, they cannot be interpreted with complete objectivity as there is usually an element of subjectivity in interpretation. Furthermore, arriving at the meaning of a text is a complex process that can be influenced by the context of the text and the audience. This is evident in the tafsir (commentary) of Qur’anic verses by different commentators. There are many Qur’anic verses that are related to the religious ‘Other’. In the tafsir tradition, some of these verses have been interpreted somewhat narrowly with an exclusivist bias while others have been read in a more inclusivist manner. Even if one adopts the exclusivist interpretations, it is important in a plural society, to treat the religious ‘Other’ with dignity, respect and hospitality. Interpretation of the Quran has always accommodated a variety of approaches both in the past and in the present. This gives us the necessary flexibility to interpret verses that are related to interreligious relations in a way that promotes interreligious understanding, harmony and coexistence without necessarily moving away from the fundamental beliefs of mainstream Islam. Sharia is a broader concept of jurisprudence that encompasses law, ethics, divinity and fiqh; and removing any of these pillars would lead to distortion. Across history, there have been differences in the conceptions of Sharia and its implementation. Present conversations about Sharia are erroneously focused on the violence of its penal punishments. Thus, the relation between Sharia, law, and ethics must be re-explored and requires a dynamic understanding of the maqasid of Islamic law. Creating a positive law of the Sharia has shifted the attention from Sharia’s objective to issues of identifying law-breakers and methods of implementing punishments. In addressing this issue, the ethical component of Sharia must be emphasised. Examples used to illustrate this were inheritance laws, specifically in relation to joint-tenancy as well as CPF nomination in the Singapore context; and the hudud law and its question of necessity if the maqasid can be met without its implementation. Five different models of Sharia application in modern states were shared. They represented the different degrees of influence Islamic Law has in the country, and its relationship vis-à-vis the state. Reviewing these models emphasised the need for a balance between implementing Islamic laws and maintaining a common space for all. While human differences are inevitable and affect how people view one another, this diversity is in fact a strength. The Qur’an and the Hadith provide guidelines to positively manage diversity and interaction with others. Being a multi-religious society, Singaporeans are acclimatized to the sensitivities of other religions yet Singaporean Muslims question Islam’s position within a multi-faith society. These questions are important to address as they might affect Singaporean Muslims’ confidence to live as good Muslims locally. Interfaith dialogue allows the enlightenment of one another’s faiths and builds common ground while still accepting fundamental differences. It is also an educational platform to clear misconceptions about the religious other. 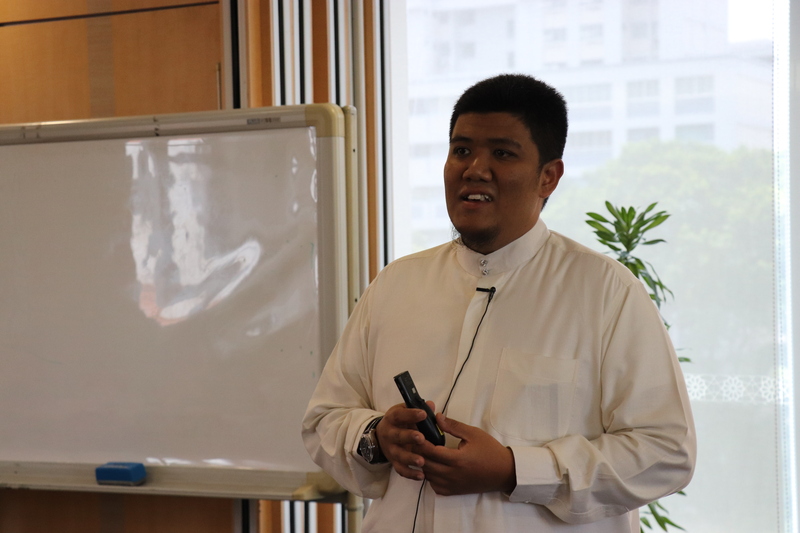 Future religious leaders must be tactful when sharing about Islam to other religious communities, and build bridges across different faiths as peace is necessary for freedom of worship. The most pressing concern raised was the growing Shia community in Singapore and the spreading of its teachings which are considered deviant. In addressing this issue, it was asserted that while there are acceptable legal and theological differences between Sunnis and Shias, the official stand is Shias are still regarded as Muslims. Thus, it should not be generalised that all Shias hold on to deviant practices or beliefs. While the confessional approach of studying Islam is common, exposure to other complementary approaches such as sociology and theology is necessary to understand the role of religion in a community and its relationship with the state. Terms such as “religion” has different meanings depending on each user and his motives and one’s understanding of religion and its function influences how he conceptualises other religions. Theoretical approaches to the study of religion and concepts like identity, the religious others, and fundamentalism were introduced. 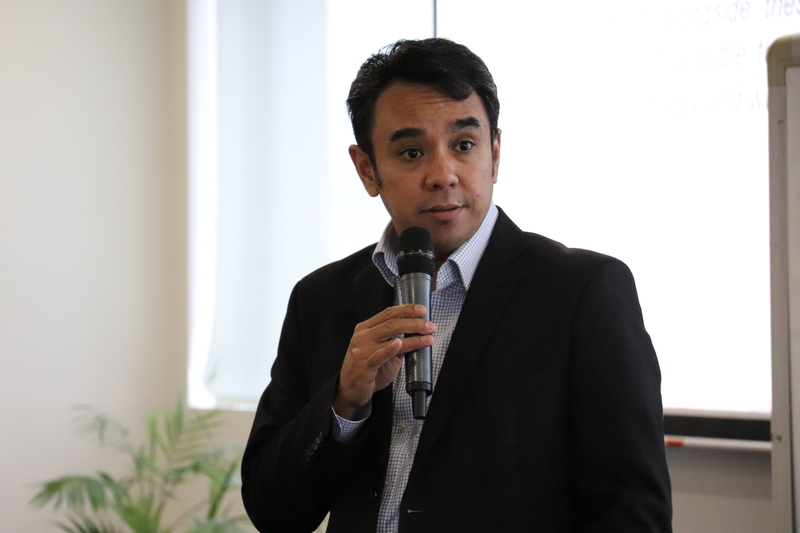 Notions of exclusivism, inclusivism and pluralism in Christian theological tradition were discussed, highlighting the principles and problems of each approach. 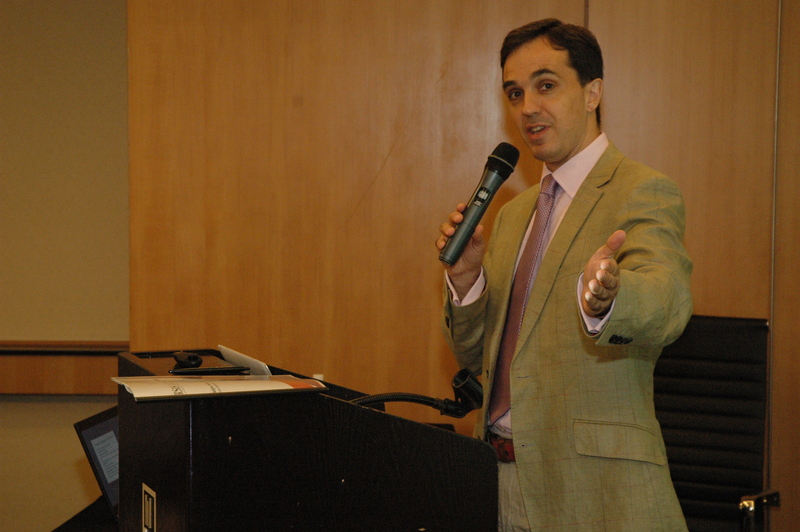 Similarly, concepts in the Islamic theological tradition were shared. 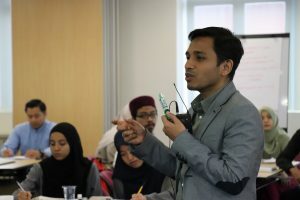 Participants extracted verses from the Quran or hadith that supported the exclusivist, inclusivist and pluralist frameworks in understanding the religious other. The exercise showed that religious traditions have diverse ways of influencing how one thinks about other traditions. The various understandings of Islamism and extremism were addressed from the viewpoints of their origin, evolution, spread and use as a marker of social identity today. Islamism is an ideology that demands an absolute and literal adherence to Islamic law and prescriptions without regard for the ethics and morality that underpin them. Islamists hold the view that the pursuit of the political aspect of the religion is central to the religion, and that it is obligatory for Muslims to establish Islamic governance. Participants had various opinions about the issue of a khilafah: some found it unnecessary for Muslims to either live in or strive for a khilafah, while others found it obligatory and deemed it the best system to govern Muslims. The concept of extremism in Islamic political thought was also addressed. Participants reflected on the dangers of extremist ideas and the concepts utilised by extremist ideologies in multi-faith communities. Discussions on the role of religion and the state requires understanding of how nation states function. The state and its citizens must adhere to the social contract; the state confers its citizens certain rights such as safety and security and must fulfil obligations such as subscribing to the state’s philosophy. The state of Singapore functions pragmatically, being liberal when it could afford it and authoritative when required especially with reference to how religion is managed in Singapore. Religion is both a necessary source of moral values in the upkeep of Singapore’s economic growth but it can also be a source of challenges such as inter-religious tensions, radicalisation, and religio-political movements. The socio-political history of religion-state negotiation has shaped how religion is situated within the state today. Singapore’s brand of secularism encompasses five features: (1) the secular state is neither irreligious (dismissive) nor anti-religious (confrontational), but non-religious; (2) it is accommodative in providing religious spaces and some differentiated laws (i.e. AMLA); (3) secularism is not pushed as an ideological project, but rather approached pragmatically; (4) religious groups are managed along principles of equidistance; and (5) the state recognises the benefits of religion in the community. Discussions on religion must be grounded in the realities of Singapore’s religion-state relationship which will evolve according to internal and external changes. Religious leaders are integral in mediating this changing relationship.